Of course in climates where winters are cool to warm, and frosts come sometime after December 1st, their late flower schedule is a bonus – a dahlia on steroids flowering when most plants are going dormant. Probably the ideal environment for growing these would be in a Mediterranean climate with only mild frost in winter. Coastal California and Oregon, southern Europe, Japan’s southern islands, or coastal Australia all seem perfectly suited to optimizing the growth and flowering potential of this species. Typically winter frosts will kill the plant to the ground. Any temperature below freezing is strong enough to kill their water filled stems. This is not a problem for the plant since it has large subterranean tubers for storing energy for next year’s growth. If the soil remains unfrozen throughout winter, then this plant can be grown outside year round. In the eastern US it is said to be fully hardy to zone 8, and marginal in 7b. Along the coastal Pacific region of the US and Canada it can probably be maintained even up to Vancouver Island, though flowering it that far north could be tricky. Dahlia imperialis in full flower is a sight to behold. 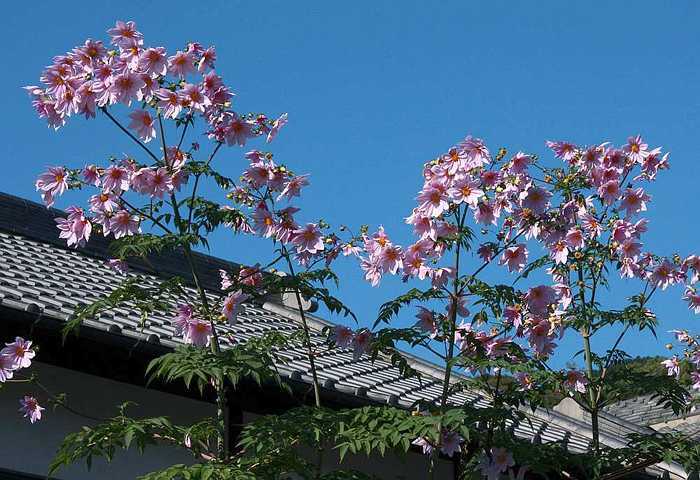 These lovely plants tower over the eves of a Japanese home on a fine November day. Tubers can be lifted in fall and kept in warm winter storage as with other dahlias. The problem comes in spring – the later you plant, the later it will begin growth, and consequently flower later as well. To get around this some growers have tried starting tubers early indoors – say around April and then planting them out once things warm up a bit. Presumably such plants will have a leg up on outdoor specimens and flower a bit earlier – perhaps before the first frosts hit. It’s a crap-shoot, but if you want to see flowers in a cooler climate you may have to try this technique. As a side note, attempting to grow these oversized plants in containers is not recommended since they are just too large, and will lose vigor unless planted in the open garden. A somewhat odd “problem” with D. imperialis in areas that don’t experience frost is that old stems do not die down in winter, but rather continue growing and flowering up until Christmas time and even beyond. 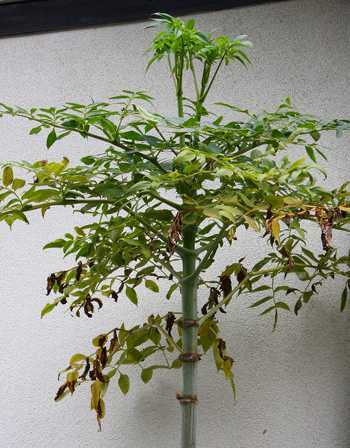 The problem is that older stems lose vigor over time (remember these are not woody plants), and have to be cut back after a couple seasons to keep the plants vital and flowering well – a “problem” I’m sure most northern gardeners would love to have! 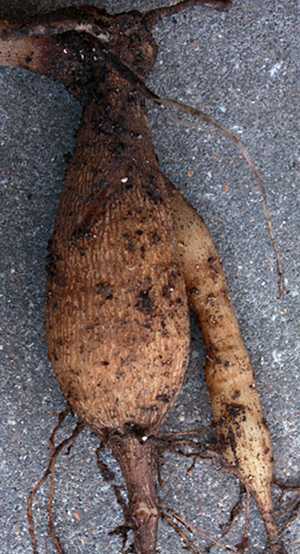 Tree dahlia tubers look a lot like other dahlia tubers except they are much larger! They seem to be fully disease free once in growth, but I have noticed that recently planted tubers are given to rot. I’ve planted a couple that never took due to this, and I’ve heard other growers report similar difficulties. Once they get established however, this stops being a problem, in fact they tend to grow too well. I have seen a number of sap-sucking bugs infesting plants, leaf-miners going to town on their succulent leaves, but even this abuse doesn’t seem to faze well established specimens. A commonly reported problem is that high winds break and deform their stems once plants get above 2 meters or so. This can be a real problem in coastal areas where winds are common, or in places that are subject to strong squalls or hurricanes. In my experience it is a good idea to support the plant starting in the fall. It doesn’t matter how you do this – wood bracing works fine, or wiring the stems to any firm structure will do the trick. This past season I watched my neighbor’s large patch get beaten almost to the ground during an early fall typhoon. Luckily, my plant was protected by my house, so it took just a few support wires to keep it from flopping over. This tendency to flop over becomes more critical when the flower heads develop since they can get heavy, particularly during rain evens. The bottom line is you need to support your plants in the fall months for best results. This is not a finicky species where it grows well. It requires full sun to grow and flower well, and a moderately rich soil that remains moist, yet well drained. Don’t worry too much about keeping the roots dry though since plants in southern Japan are subjected to 6 weeks of nearly unending rain during the summer monsoon, and don’t suffer in the least. You can fertilize them if you like, but as long as your soil is even modestly rich you’ll probably not want to encourage them to grown any bigger or faster – these are truly giant perennials! Pruning of the lead growth is NOT a good idea if you want flowers however, so just let them do their thing. They can be grown from seed, or better yet, from stem cuttings after flowering is finished. Simply cut the stems into segments that have at least two nodes. You can completely bury these into the soil or plant them vertically with the lower node underground. Keep them evenly moist and above freezing. 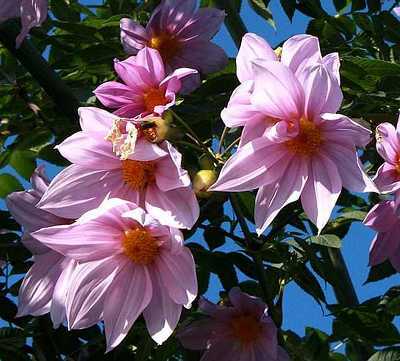 Eventually, they should root and throw new leaves – a fast way of increasing your tree dahlia collection. Though not the perfect plant for every garden, the tree dahlia is a show stopper when in flower. 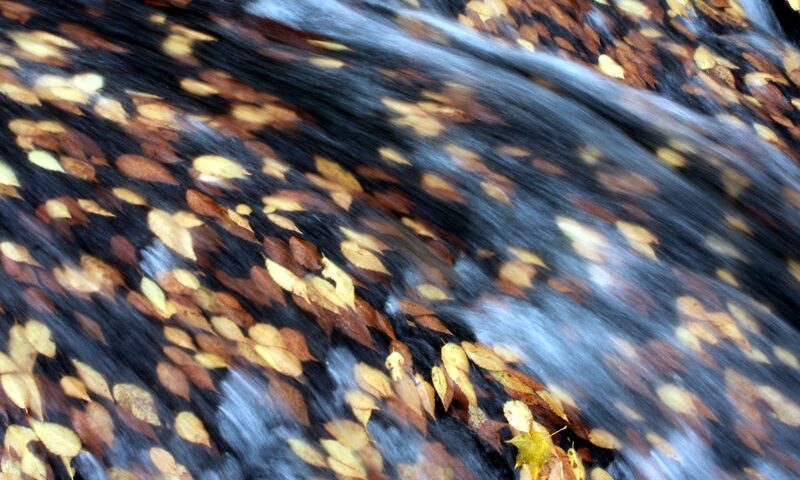 If you live in a mild climate with warm summers and relatively long, warm autumns, then I’d give this one a try. There are a few at JC Raulston Arboretum at NCSU. Thank you for a very informative page. My wife and I came across this beautiful flower this past weekend in Amakusa City, Kumamoto-Ken, Japan. We spent hours on the internet looking for pictures and a name so we can try and grow them here in Okinawa where we live. Thank you for your complete description! I live in the south of France near Avignon. We succesfully tried to get plants from cuttings. Do the cuttings grow into tubulars in one year? Getting them to establish the first year is a bit tricky, but once they settle in they are easy. They should have tuberous roots by the first season. My plant is about 6 years old. At 5 years, the top was covered with buds, but, a minor wind storm came up and I found the whole plant laying on the ground. The first 4 years, the plant was not able to make buds before cold weather set in. But, this past fall, the well-staked plant bloomed gloriously up above the roof of the house. It is now mid-March, and the new stems are already 3 feet high — last year it was July before they got that tall, so, I am thinking that the first flowers might open in October, versus last year’s November. Tuber is as hard as cement — I am afraid it might soon crack the abutting concrete sidewalk. New Orleans, Louisiana. Thanks for this information. Was searching already a long time for name and details of this beautiful plant that I discovered in Nara (Japan). Hope to (try to) grow it myself in Belgium. Now searching for plantmaterial! TX. The the Peope in Avignon , aucune difficultee de cultivar les Giants tree dahlia , pour vous et a cause du mistral infaudra les mettre a l’abris expose au sud , les mien ici a cote de san Francisco font pres de 8 metres et le ve les casse assez souvent , il demandent de l’humiditeed alors soyez generux , sol Presque tous , bonne chance . Without success I’ve been searching for a source. I live in Northern California. Can anyone help me? I once had some stems a friend gave me. I’d prefer to buy bulbs or rhizomes. I can’t speak for California, but this species is pretty available online. Just do a google search, and you’ll find vendors. I know Plant Delights in North Carolina had some and at not so expensive prices. Concerning growing them from from tubers – it takes time to establish them well. I lost a couple before one finally took, so don’t give up if you fail the first time. Good luck!